The FAA has issued State Farm the first national waiver to fly drones over people and beyond a pilot's visual line of sight to conduct damage assessments. The insurance company says this will make the claims process more efficient. AUVSI has joined with several aviation-related organizations in calling for an end to the ongoing federal government shutdown. Brian Wynne, AUVSI president and CEO, said the shutdown jeopardizes the safety and security of the U.S. national airspace. 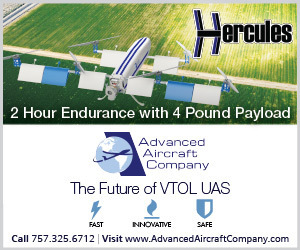 The advantages of hydrogen fuel cells as a UAS power source were recently demonstrated when a 44-pound drone carried an 11-pound payload nonstop for 70 minutes, a new industry benchmark. The project is supported by Innovate UK. A research paper from the University of New Hampshire Department of Natural Resources says that drones have the potential to provide timely and accurate reference data on forests to help make better make better forest management decisions. Drones and robots are seeing increasing use in the energy industry, but this technical revolution hasn’t yet caught on in the biomass energy industry. Black & Veatch and Interactive Aerial discuss potential UAS uses for the biomass market. FLIR Systems and DJI will further their collaborative efforts with the integration of FLIR's Lepton micro thermal imaging camera into DJI's Mavic 2 Enterprise Dual drone. It marks their second collaboration under the Thermal by FLIR program.